NOTE: This page is archived and is no longer updated, so there may be broken links. In other words, click at your own peril! These new Gelert colours are now available as Shopkeepers . If you like the Royal Gelerts but cant afford the paint brush, at least you can have them as Buddy Icons. As promised in yesterday's Editorial, you can now add this cool Space Faerie Blog to your shop. The last semi-final in our Staff TCG Tournament has been won by Captain Canada, who beat Dragona 3-0. We will be holding the Final on Monday! Webpages for Lupes, Shoyrus and Kacheeks are now live. Gelerts can also be painted Speckled. 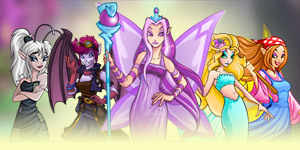 Did you know that you can go to http://www.neopets.com/aisha now? We will be doing this for all our species in the near future! We totally forgot to activate the Speckled Mynci and the Plushie Chia. Sorry about that! They are live now! The 131st issue of the Neopian Times has just been released. Tune in for all your favourite articles, comics and stories! We have a new Mystery Pic today! The answer to the last one was the 'MAGAX: Destroyer Click to Play Image'. Give your computer a touch of Gelert Day with this new Desktop Background. This week's Neohome Spotlight has been awarded to Brume, proud owner of 140877 Main Street, Neopia Central. The Bakery has come up with this rather neat idea of baking individual sized cakes for Gelert Day, pretty cool eh! 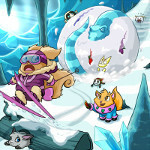 Congratulations go to SnapDragon73, they have just won the last Pet Spotlight award of the week. The Art Gallery has pages and pages of Gelert themed pictures! If your Neopet enjoys reading, they will just love these new titles on sale in the Book Shop - Gelert A to Z, Gelert Anatomy, Baby Gelert Pop Up Book and Gardening For Gelerts. The ever generous Cap'n Threelegs is giving Free training to Gelerts all today and tomorrow! Gelert Day wouldn't be the same without a Gelert themed Blog now would it? Your Neopet will be the envy of the School with one of these new Gelert themed School items. Welcome to the first day of content that has been written in advance! Yes, assuming all goes well you should be reading this early on the 4th of March, as opposed to the 5th :) We hope you all like the new change! Today's TCG Card of the Day is none other than The Three. 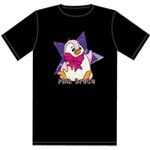 Starting this Saturday you can get a Pink Bruce T-shirt to go with your Pink Bruce plushie from 99 Dogs! Niptors, Mazzews, Baby Blus and Anubis can now be painted in these lovely Island colours. Perfect for Gadgadsbogen eh! Speaking of Mazzews, they just won this weeks PPL!!! Congratulations to XHadoukenX, Brownie Cakes, eXtRaLiTtLeAnGeLrUeZ and the rest of this week's winners. Oops, due to a technical error the Mystery Pic went live yesterday. The answer to the last one was 'Count Von Roo's Coffin'. The last quarter-final has been played in our TCG Tournament. Dragona decimated Warren 2-1. That just leaves four people, and the draw for the semis has just been made! How can you resist these new Hasee Bounce Buddy Icons? Make sure you pay a visit to Stealth_commander's shop - Gadgadsbogen Paradise. This colourful shop is filled with all kinds of fruity delights and berries galore. Impress all your friends by showing off this new Gadgadsbogen avatar on the boards. Ok, so its not really Gadgadsbogen themed at all, but this week's Petpet Spotlight award goes to a rather seasonal Horus called Kira. Wish everyone you know a Happy Gadgadsbogen with one of these rather fetching new Neogreetings? Can you complete Sweetp205's Neoadventure Spotlight winning Neoadventure - Gadgadsbogen Day? Dr. Sloth stormed over to the Island Mystic who had retreated to his hut. He sat down on the floor infront of the Mystic and said, "Do you have any idea where Jhuidah went?" The Island Mystic's eyes opened wide and he replied, "You will have a sudden urge to drink an eyeball slushie!" Who would have thought they would ever see a Skeith with a flower tucked behind their ears!!! The latest Site Spotlight award is shared by Bauboa and Houndour415. The contestant in this week's Better Than You is ... The Court Dancer. Kaboom! Pirate Cave of the Week is the Kaboom Room. Poor Hannah! If you go to the Art Gallery you will find lots of new Gadgadsbogen related pictures on display. Yes, that is correct. March the 3rd will not be happening. Basically, we are now syncing the daily content once per day, and because of all the extra things we have to do (syncing to 120 servers, translating the site), it is happening much later than usual. As a result, by the time the site syncs the actual day that news refers to is over in more than half the world. The fact that we are 8 hours behind GMT does not help that fact either. Australians, for instance, will first hear about Uni Day (March the 2nd) at 4pm on March the 3rd, and those playing from Nuku'alofa in Tonga have it even worse! Also, Half Price Day will be the 3rd as usual. Today's TCG Card of the Day is the Darigan Gardens. The Haunted Woods would be proud. Learned Neopets will be thrilled to hear there are some new Uni themed Books on sale. We have a new game from Lucky Charms, why don't you give it a try? We have some new Uni themed Poems on display. How unusual, Unis can now be painted Snow! Well, Rink Runner wasn't giving out that many NP so we increased its payout by 50%. Today's Site Spotlight award goes to Teera_misu and Amaretta_Creme. Can you figure out how to get hold of this fabulous new Uni avatar? If you get hold of a Speckled Paint Brush, you can now transform your Uni! Get your shop in the Uni Day mood with this new Blog! These yummy Uni Day Sandwiches are always a hit at parties. Available in four delicious flavours including Chokato and Grilled Cheese. Warren has made his way into the Quarter Finals by beating Omega13 2-0. We hope to finish the games soon, sorry about the wait! Keep your Neopet amused with one of these new Uni themed Toys. The Spotted Rocking Uni is sure to be a hit! This new Uni Day Desktop will soon brighten up your monitor. Lots of new Uni Shopkeepers have been added (27 to be exact), you should now be able to have any colour Uni that exists. Make sure you take your Uni to visit Cap'n Threelegs today, or they will miss out on all that lovely FREE training. The Art Gallery is full of new Uni pictures. Also as a reminder Gelert Day is coming up so you need to send in your Gelert themed spotlights, pictures and poems asap. Wish your friend a happy birthday, or let them know how much you miss them or love them with one of these new Neogreetings. Today's Caption Competition has just started, and it has a St. David's Day theme! Can you think of anything funny to say? The winner of today's Gallery Spotlight is ginger23456. Just a reminder - you can get a FREE issue of the Neopets Magazine thanks to a great special offer that Beckett are running. Click here for more details! Yes, since its the first of the month all the Multiplayer Games have been restarted. Here are the long-awaited Plushie Tycoon winners for February. Congratulations to the winners and thanks to everybody who participated! We have changed both our Slots games so that it's slightly easier to win NP. Also the chance of winning a dubloon has been doubled. What better way to celebrate St David's Day than with a cold can of Achyfi? Four new delicious flavours have just been released. 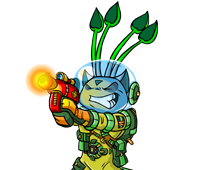 Today's Pet Spotlight award goes to an Acara called Blue_Moon448neo. Four new Battle For Meridell Stamps have just gone on sale, including the Nova Storm Stamp and King Skarl Plushie Stamp. A new Storytelling Competition has just begun. Give your Neopets a real treat on this special day... a big bowl of Cawl and a generous chunk of Lava Bread. Make sure you cast your votes in this week's Beauty Contest! Give your Neopet the best Battledome Equipment with a set of Shadow Armour, a Battle Hammer and a Tower Shield. Why not give someone you care about one of these hand carved Love Spoons? (They are a welsh speciality in case you are wondering).